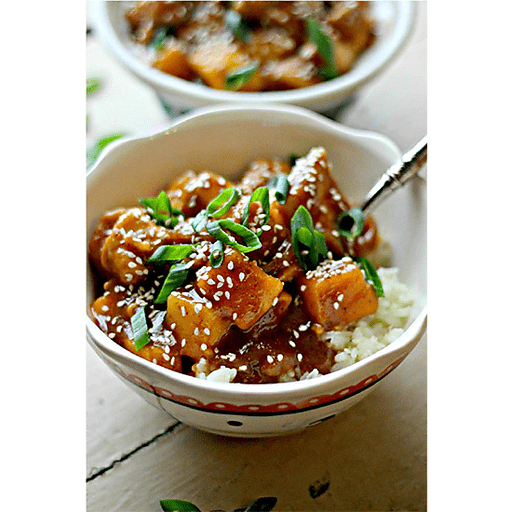 This is a super fun version of Sesame Chicken that is extra delicious and extra nutritious. Who said good-for-you can’t taste great? 1. Place dates and hot water in a bowl and soak for at least 30 minutes, until soft. Remove the pits and discard. 1. In a food processor or blender, puree soaked and pitted dates and their soaking water, soy sauce, rice wine vinegar, garlic and ginger. Set aside. 1. Heat oil in a wok or large skillet set on medium-high. Add the onions and saute 2-3 minutes, until softened and starting to brown. 1. Combine flour, salt, pepper and chili powder in a shallow bowl or pie plate. Toss chunks of chicken breast in the flour mixture until coated. Set aside. 1. Add coated chicken breast chunks to the hot wok and saute until outside is browned. Pour date sauce and chicken broth in to the pan with the chicken and reduce heat to medium. Allow to simmer for 8-10 minutes, covered. Add mango chunks and simmer 5 additional minutes, covered. 1. Serve over rice and garnish with sesame seeds and sliced green onion. Calories 270, Total Fat 4g (Saturated 1g, Trans 0g), Cholesterol 45mg, Sodium 940mg, Total Carbohydrate 37g (Dietary Fiber 3g, Sugars 16g), Protein 22g, Vitamin A 15%, Vitamin C 10%, Calcium 4%, Iron 10% *Nutritional values are an approximation. Actual nutritional values may vary due to preparation techniques, variations related to suppliers, regional and seasonal differences, or rounding.